Unverferth Introduces UHarvest™ Data Management Solution - Unverferth Mfg. 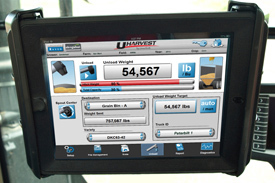 Decatur, IL – Unverferth Manufacturing Company, Inc., announces the introduction of the UHarvest™ data management system, the first-ever solution for collecting and managing grain cart weight data using the tractor’s ISOBUS terminal or a touch-screen tablet. Grain carts equipped with load cells are the traditional way to accumulate harvest data. The Unverferth UHarvest data management system, powered by Raven Industries, combines software that allows the user to easily track and analyze as much harvest data as needed with state-of-the-art touchscreen operation. The touch-screen interface offers a quick and convenient way to track the standard grower, farm and field information as well as crop, variety, truck identification and destination of every bushel that moves through the grain cart. The UHarvest system’s AccuSave technology also features a drivetrain sensor attached to the cart for automatically recording each load for data accuracy without the need for operator intervention. The UHarvest system offers easy installation on any grain cart equipped with scales. Its ECU attaches to the grain cart and connects to the scale load-cells. The processor plugs into the existing tractor ISOBUS connection and is ready to operate. For tablet operation, the UHarvest processor’s built-in WiFi signal provides a reliable and secure connection. This closed-system Wi-Fi also provides connectivity for allowing others within a 400 foot radius of the processor to view the grain cart’s information via password-protected access using a tablet computer or smartphone. The UHarvest software also provides a combine verify mode for calibrating the combine’s yield monitor in real time and a hitch weight management feature for helping the combine and grain cart drivers keep the cart’s contents evenly distributed. Harvest data can be downloaded from either the processor’s USB port to a thumb drive or uploaded with a few touches to a secure Raven Slingshot® web-based server when using a tablet with a data plan. This securely stored information can then be used for reporting and sharing with landlords, farm managers, agronomic advisors, crop insurance agents or others. UHarvest system options include AccuLoad for automatically loading a predetermined amount of grain into semis or wagons and Moisture Sense technology for automatically storing and converting each load to dry bushels. Availability of the new system is slated for 2014. For additional information, contact your nearest Unverferth UHarvest system dealer or visit Unverferth.com.